The CP+ and CP+EA warm air cabinet heaters are indirect gas or oil fired air heaters fitted with dynamically balanced centrifugal fan sets with belt driven motors, stainless steel combustion chamber and mild steel heat exchanger. The CP+ warm air heating range has been designed with a range of outputs up to 1MegaWatt, and is ideal for heating large factory and warehouse spaces. Heaters are available with a comprehensive range of oil, natural gas, lpg and liquid biodiesel fired burners. 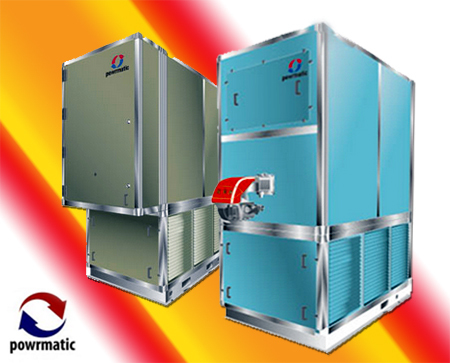 A Powrmatic control unit is supplied with every heater.